Jonathan Casillas (born June 3, 1987) is an American football linebacker for the New York Giants of the National Football League (NFL). He played high school football at New Brunswick High School and college football at Wisconsin. He is of Puerto Rican and African-American ancestry. He played college football at Wisconsin. He went undrafted in the 2009 NFL Draft, but was later signed as a free agent. Casillas was coming off surgery from a knee injury and was only a participant in the bench press at the NFL Combine. In Super Bowl XLIV, he was officially credited with recovering a third-quarter onside kick for the Saints en route to their 31-17 victory over the Indianapolis Colts. 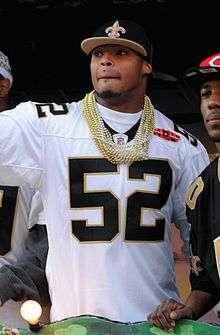 Casillas was expected to take over as the Saints' starting weakside linebacker for the 2010 season. However, he suffered a foot injury during the last game of the preseason, and he was placed on the injured reserve list, ending his 2010 season. Casillas signed with the Tampa Bay Buccaneers on March 13, 2013. He played in 12 games before being placed on injured reserve after suffering a knee injury. On March 7, 2014, Casillas re-signed with the Tampa Bay Buccaneers on a one-year deal. Casillas, along with a 2015 sixth-round draft pick, was traded to the New England Patriots on October 28, 2014, for the Patriots' 2015 fifth-round draft pick. On February 1, 2015, he won his second Super Bowl ring when the Patriots defeated the Seattle Seahawks, 28–24, in Super Bowl XLIX. On March 10, 2015, Casillas signed a three-year, $10.5 million contract with the New York Giants. ↑ Will the Saints Find Gold in the 2009 Undrafted Free Agents Class? ↑ "Saints Coach’s Pair of Bold Bets: One Miss, One Turning Point", New York Times, Joe LaPointe February 8, 2010. ↑ "New Orleans Saints' Jonathan Casillas out for the season", The Times-Picayune, September 04, 2010. ↑ "Bucs place Jonathan Casillas on injured reserve", Profootballtalk.com, December 4, 2013. ↑ "Linebacker Jonathan Casillas signs four-year deal with Giants". nj.com. Retrieved 11 March 2015. ↑ Eisen, Michael (March 11, 2015). "Giants sign RB Shane Vereen; announce Free Agent signings". Giants.com. Retrieved March 12, 2015.